AOB…the woods are on fire! You are here: Home / General Property Issues / AOB…the woods are on fire! In a recent telephone discussion with the Division of Insurance Fraud (DIF) concerning Florida’s nearly 50,000 annual AOB lawsuits, I was told they’re investigating nearly 200 complaints of AOB abuse from roofers–many are likely to become full blown fraud investigations, all from the same part of the state. Again, this is just roofing! Just in Citrus County! No lie, my last report set the woods on fire! Calls and emails flooded from every corner, including one anonymous hard-copy memo, (See NOTE #3 below). I received more from industry veterans who say they’ve never seen figures as compelling as those in my last blog; AOB..an ugly iceberg! Or, I suspect, as compelling as those you’re about to read. Notice; there were no AOB lawsuits filed against these insurers prior to 2006. Zero! Nada! Zilch! Then, after a public adjuster filed the first AOB suit in 2006 eight (8) followed in 2007. And the scam grew wings, culminating with 2,014 AOB lawsuits last year. (See NOTE #1). Florida Peninsula was sued 253 times last year and 435 times the last two years (See DFS Report here). And Florida Peninsula has already been sued 80 times for AOB within the first 45 work days of 2015. Now look at Citizens. It started with 5 AOB lawsuits in 2007 and last year was sued 818 times via AOB–an increase of 6,000%. Citizens president, Barry Gilway, confirms that 85% of his company’s Dade County water claims are “noticed” from lawyers, not policyholders–no call to the toll-free claims number; no loss notice completed by the policyholder or agent. And, the same ten law firms are responsible for over half of “all” Citizens lawsuits. Why bother with filing a claim when filing suit starts the ticker on the $400 hourly fees necessary to force payment of bills inflated by an average of 60%?! (See NOTE #2 below). Here are just four side-by-side comparisons showing how water extractors inflate their invoices–some are from the very same actors testifying during recent legislative hearings. Example 1: Inflated by nearly 250% or $10,357.52. See yellow highlights for: excessive drying days and additional charges such as “Overhead & Profit” roughly 20% or $2,410.42. Example 2: An 874 sq. ft. home over-billed by $13,904.31 or nearly 500%. Some highlights are excessive drying days and charges for overhead of $1,426.68, profit of $1,569.31; and, get this… a check handling fee of $1,250. Example 3: A 1,329 sq. ft home inflated by 300% or $10,216.14. Highlights are excessive number of drying days and add-on profit/overhead of $2,501.44. Example 4: A 1,183 sq. ft. home with excessive drying days inflated by over 350% or $12,792. See highlights for overhead & profit of $2,947.86 and a separate fee for “Equipment decontamination” of 28 units at $35 each. This was a Category 1 claim from a leaky “laundry room sink”. No decontamination should be necessary. Such fee’s shouldn’t be in addition to a separate “overhead” fee. So, there you have it. Including the “end notes” this is more than you ever wanted to know about AOB abuse, again. And, there’s still more you haven’t heard, including how much it’s all going to cost homeowners and families if lawmakers don’t do something about it soon. Stay tuned for my next report with more on AOB lawsuits by specific vendors and why simple politics may be the biggest barrier to a solution. NOTE #1: Keep the data limitations in mind here. This number is low because DFS Service of Process (SOP) filings don’t “require” the plaintiffs to identify the suit as an assignment of benefits. The true total, therefore, is likely much higher. 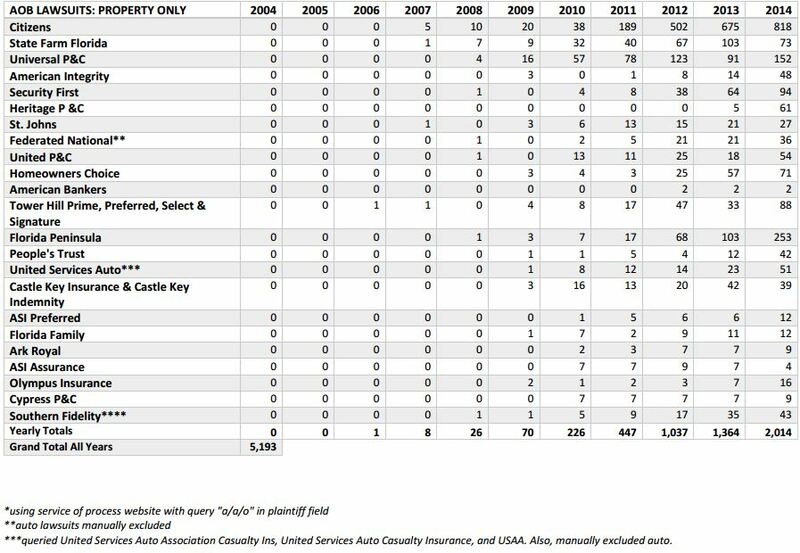 Also, State Farm Florida, one of the largest residential writers, shows only 73 AOB lawsuits. This is likely because the person reporting to DFS did not specify State Farm Florida but only entered “State Farm”. NOTE #2: In addition, 84 percent of all Citizens claims in the past five years have originated in Miami-Dade, Broward and Palm Beach counties. The same ten law firms are responsible for over half of Citizens lawsuits 60 % of which come from Miami-Dade. 70% of first notice of loss are water claims. 65% of those claims involve a broken pipe–the kind of claim where the plumber gets a referral fee; as of December 2014, 562 lawsuits were filed for water claims and 98% of those filed were from the tri-county area, Miami-Dade, Broward, and Palm Beach counties, and; AOB water claims are 60% higher than the non-AOB claims, for Citizens. Those claims are coming in from an attorney, a notice of lawsuit, or public adjuster. NOTE #3: Along with others, including lawmakers, the media, Cohen & Battisti law firm and the IRS Criminal Investigations unit, I received a copy of an anonymous memo from someone claiming to be the “Remediation Cockroach.” It was ostensibly written by a small water extractor fed up with dishonest practitioners of his trade; including those he claims lied during legislative hearings. I don’t take anonymous missives seriously, but…you can read it here if you want. If the author wants to send me facts, supporting documentation, pictures, whatever; I’m willing to listen and publish that which I can verify; but, he/she must identify him or herself. NOTE: Though I will never reveal your identity to anyone, neither will I publish as fact unsupported accusations from anonymous sources. 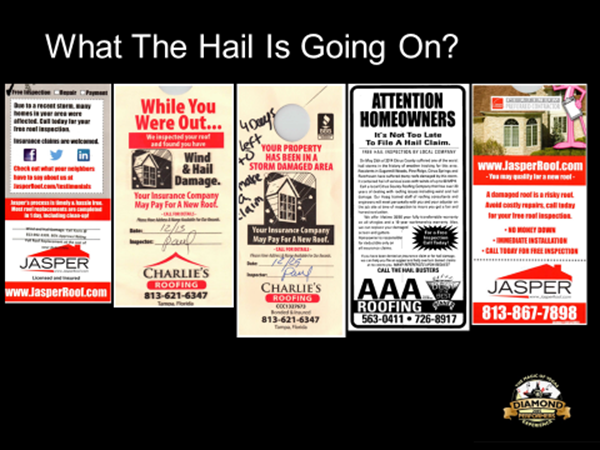 One year after storms AAA Roofing offers to help appeal or overturn denied claims here. Document showing assignment of public adjuster as part of work authorization contract here. Roofer advertises Free Roofs here and possibly public adjusting without a license here. A collection of miscellaneous door-knob flyers from one neighborhood, here.